With the survey in its fourth year we are able to record and report and number of changes. This year some of the biggest changes are in the enablers and drivers for use of learning technology. 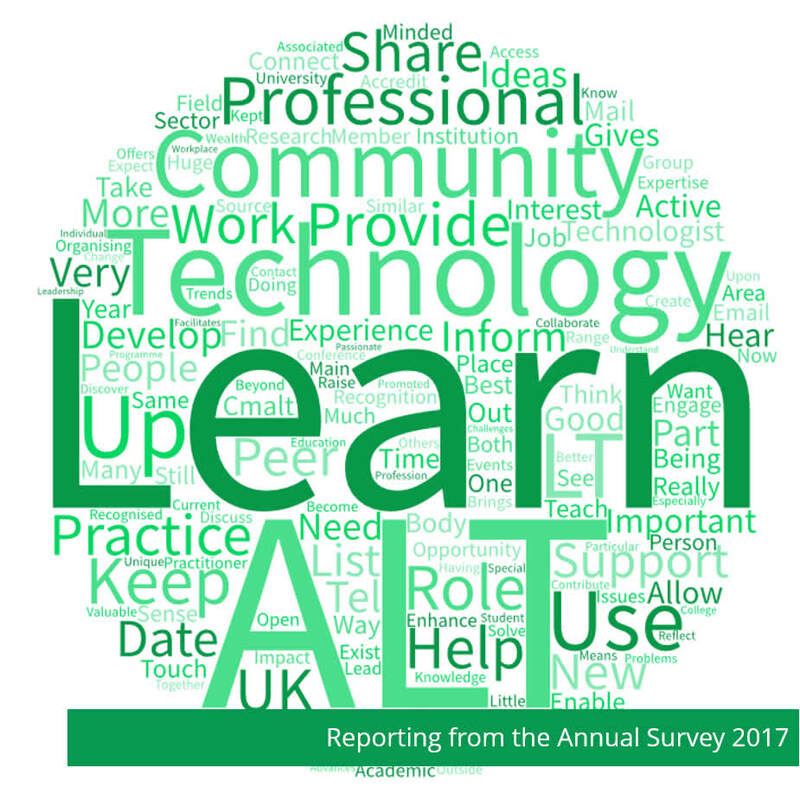 This year’s survey sees the first change in the top three areas respondents agree or strongly agree as enablers/drivers for the user of learning technology. As with the ALT Annual Survey 2016 the top enabler for the use of learning technology was ‘Engagement from students/learners’, but this is now joined by ‘Colleagues' commitment’ in second place followed by ‘Staff development opportunities’. The survey also recorded the greatest increase in ‘Recognition for career development’. Responding to the survey is an important way for Members to inform the priorities for ALT as part of the wider aims set out in ALT’s Strategy 2017-2020. One of the areas of importance Members highlighted in the survey was leading professionalisation in Learning Technology, with for example the Register of CMALT portfolios and the pilots for new CMALT pathways both achieving high recognition with 61-62% awareness. Related to this, 53% of respondents were aware of the mapping of CMALT to other frameworks and 54% of responses indicate this as an important or very important area. Pathways to CMALT, which will establish new ways to recognise and reward career development with the new pathways to CMALT accreditation, is the largest innovation project ALT has undertaken independently since the ground breaking ocTEL online programme. This year will see this exciting new project scaling up to include further mappings beyond the Jisc Digital Capabilities framework, the UKPSF and the Blended Learning curriculum. In light of responses to the Annual Survey we are also committed to reviewing how these existing CMALT mappings are signposted to candidates and whether there are opportunities to integrate these mappings into the CMALT support. A focus in increasing the impact of research and practice in Learning Technology was also highlighted throughout the survey, in particular how we measure the impact of research published through channels like the ALT’s journal, Research in Learning Technology, for example by applying for an impact factor which 62% indicated as important or very important. Taking this forward will be a newly established Journal Steering Group, which will help steer the development of the journal and we are grateful that representatives from other scholarly bodies who are publishing in a similar model, have agreed to join the group to share best practice and support each other. Alongside the work on the journal, we are also looking forward to the the establishment of new ALT Research Awards, which will celebrate excellence in research in Learning Technology. ALT is also continuing its commitment of enabling the sharing of research and practice with a range of accessible staff development opportunities including publication via the #ALTC Blog, events including the ALT Annual Conference and the ALT Online Winter Conference, as well as reviewing the ALT-MEMBERS mailing list. The full report and anonymised survey responses for this year and previous years are shared openly in the ALT Repository.